It’s stocked with a variety of good quality books that we hope will interest everyone – adults and kids alike. Stop by and take whatever catches your fancy. Return the books you borrowed when you’re finished reading them. Also bring any gently used books you wish to contribute. 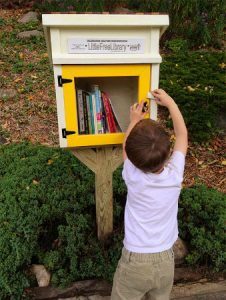 Because of communities like ours, the Little Free Library movement has rapidly grown. Many Libraries have been installed and thousands of books shared around the country as well as around the world. For more information, check out the pages and websites below. Happy Reading!